I recently got a tablet (it’s an Android, Transformer Prime, for my fellow geeks). What’s the first thing you need after getting a new tablet? 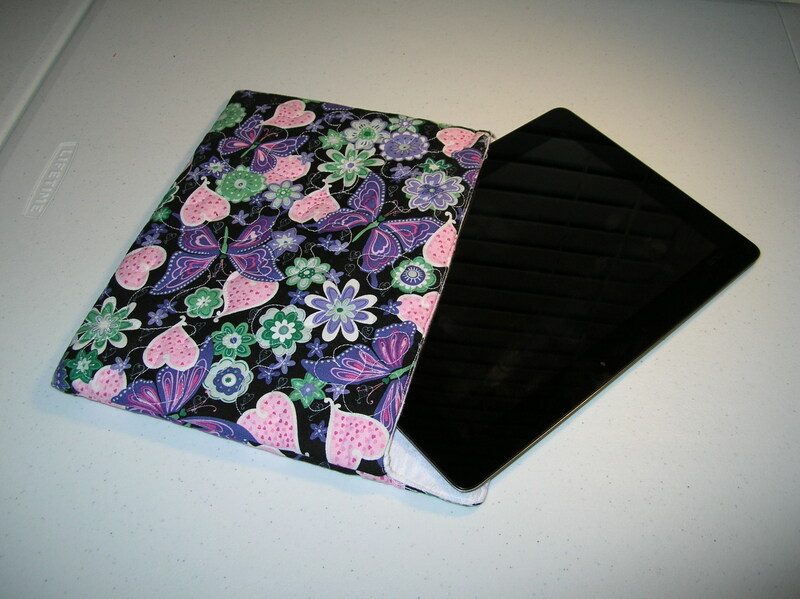 A new tablet case, of course! And should I buy one? Oh, no. 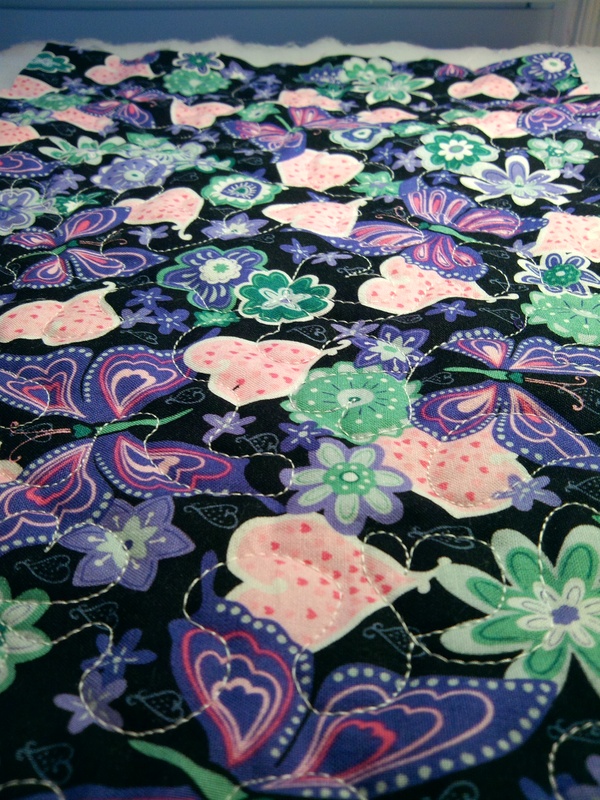 I should make one of pretty fabric with padding and quilting. Yaaaaay! So, taking the flannel envelop I’d already made, I “measured” it, cut the batting and the outside fabric. I quilted the batting and the outside together, then made an envelop out of that. So far, so good, right? It wasn’t until I tried to join the outside to the inside that I realized I’d done the “measuring” really, really, badly. Oops. I managed to get all the pieces to fit together by brute force. Then I went to slide in my tablet. It was more like shoving, pulling and coaxing, not so much sliding, but it did eventually go in. Turns out, the opening was too small too. My first thought was that I would have to redo it immediately, just to get a case that would fit. After using it for a while, however, the fabric loosed up enough to not have to fight the tablet into the case every time. I’ll still make another one that fits better, but at least this will work for now. 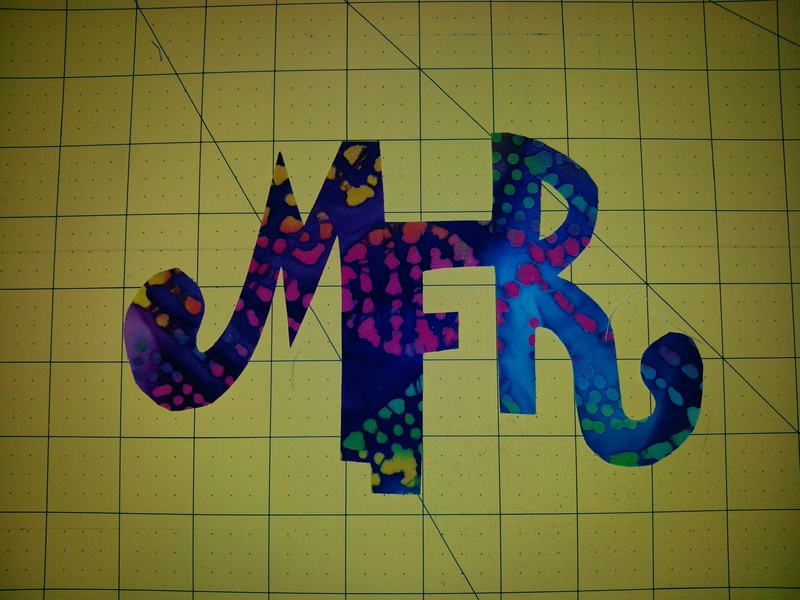 I had a burst of inspiration a while back on a design for a monogram of my initials. Normally, I don’t work in bursts. I’m more of a think about it, plan it, think some more, then, assuming I haven’t already lost steam by this point and moved onto something else, then I make it. This time, however, as soon as I thought of this I started drawing it out on paper. Once I got it on paper how I wanted it, I cut it out. I ironed on some fusible applique paper to the fabric I wanted to use. 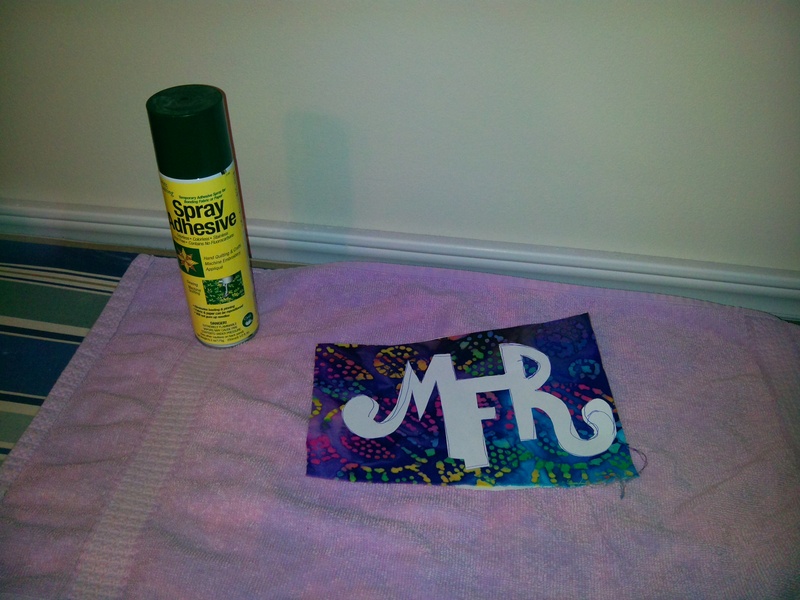 Then I spray basted the paper to the fabric I wanted to cut it out of with a removable spray adhesive. 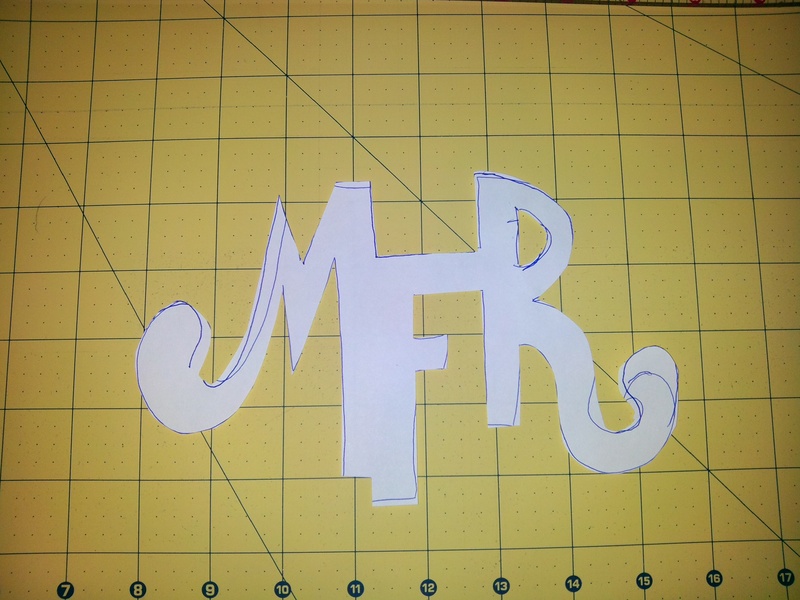 I cut out the monogram and took off the paper. Voila! 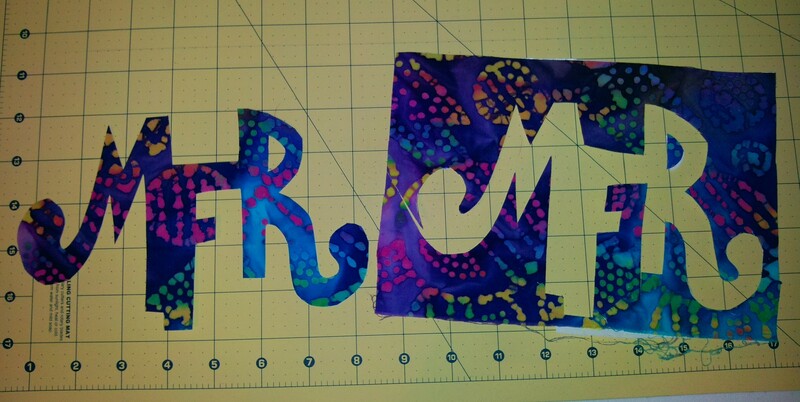 I liked doing it this way because the spray baste on the paper made it really easy to cut it out of the fabric. I didn’t have to worry about transferring the design onto the fabric or pinning it down or anything like that. I was looking at my blog the other day and realized that I hadn’t posted some of the little projects I’d been working on. So, here’s an update from a (good, long) while back. A couple friends of our family was celebrating their 40th wedding anniversary. While I wanted to make a card using our Cricut, I couldn’t find anything I liked on any of our cartridges. I went into Craft Room and designed a simple merged text that I liked using Lyrical Letters. Then I fought the silly computer for almost an hour or more just to get all the software right and everything connected, etc, etc, etc. Pain. The long and short of it is that I won the battle of making it work, but at the cost of running out of time for the overall project (doing this at the last minute? who? me? never!). While I don’t hate the card, I can’t say I’m horribly impressed with it, either. 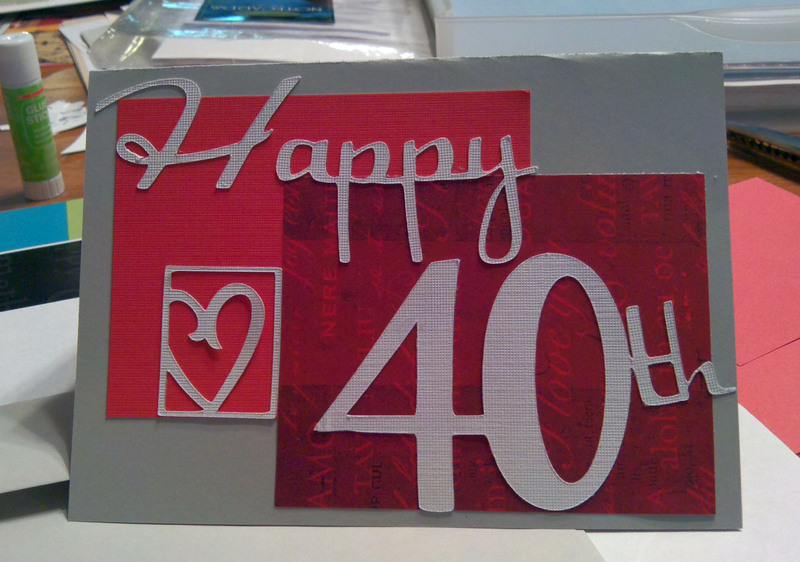 Hopefully next time, I’ll start a little sooner so I can have time to fight the Cricut and still design the card decently. 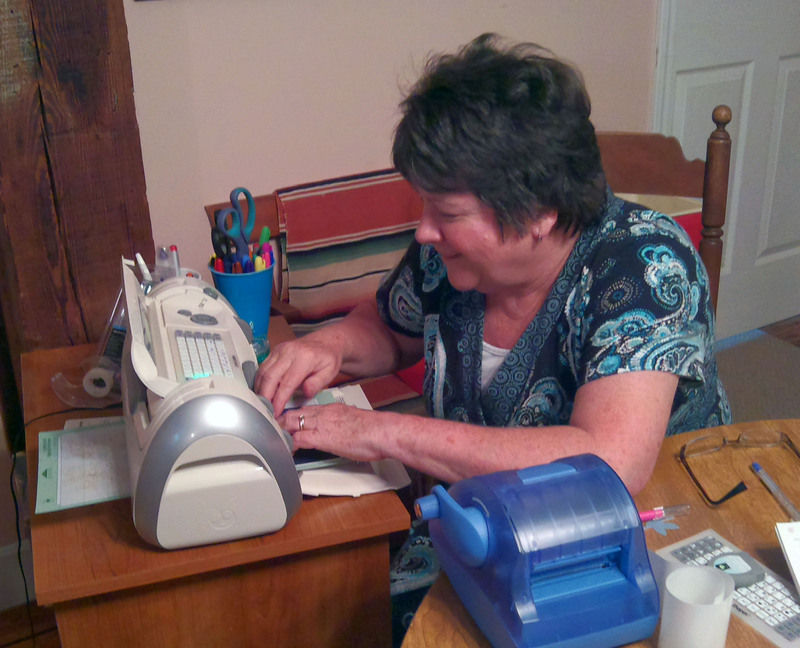 Mom working the Cricut. It didn’t fight her, go figure. 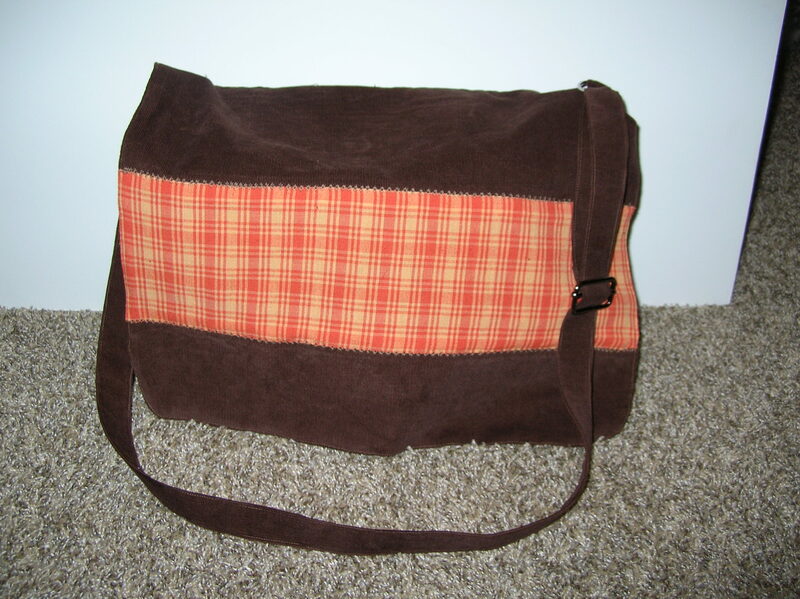 For my sister’s birthday, I was going to make her a messenger style bag for her laptop. What I actually gave her was a promise for her birthday and then finally finished the actual bag about a month later. I know, I stink, but the bag turned out even better than I thought it would. So, on one hand, I’m sort of glad I took the time to make it the right way and the way I thought it should be. It’s got an adjustable strap (way easy, by the way. I was intimidated by it when I thought about adding it, but it was one of the easiest parts) and a front flap (with rounded corners, even! I love rounded corners on messenger bags 🙂 ). 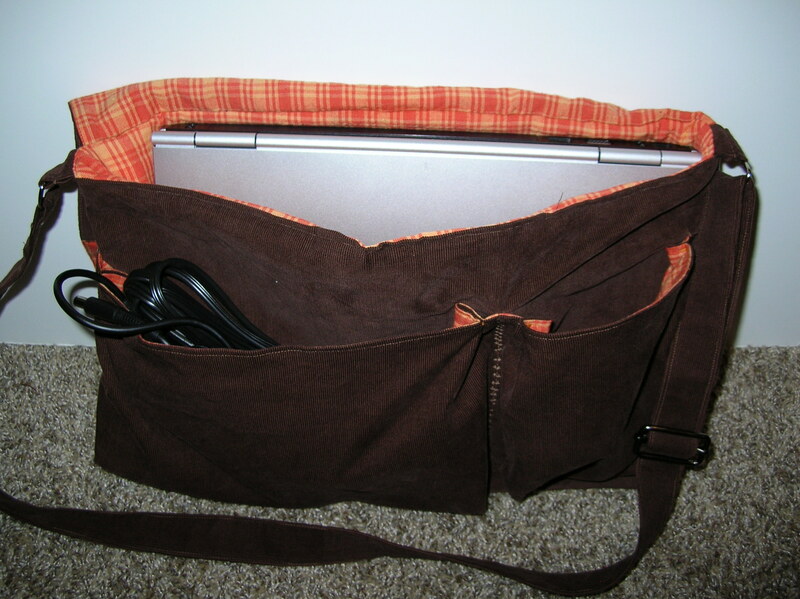 On the inside, it’s got one large pocket that’s laptop sized and it’s padded. For the padding, oddly enough, I used the Warm Tater batting by Warm and Natural. It’s thicker than regular cotton batting, but not quite as thick as doubling it. I thought it was the perfect weight for providing a little extra bump protection without bulking up the bag too much. And, I also have enough left over to make myself a potato bag, if I so feel like it. It’s got two front pockets, one large enough for a charger and then a misc. sized smaller pocket. The pockets are two inches deep, making for a little bit of an adventure as I had to figure out how to keep the top from flopping all over the place. It seemed loose enough to dump out the contents, if the carrier was carlessly carousing. Knowing what I know now, I’d have cut the pockets to be angled in towards the top so the bottom was two inches while the top was only about one or so. As it was, I think I managed to get the tops pulled in and still keep the depth at the bottom. I’m hoping to work out a repeatable, patterned version of the pockets and turn it into a tutorial sometime soon. I learned a lot on this project, just about how to keep the quality high even when I’m kind of figuring things out. I think that there was a step up in quality of my work a bit on this one. Maybe not in a way that you can see by looking at the bag, but in more my ability to get the pattern figured out and get it all assembled, and then recover from the mistakes I made while assembling it and still finish it decently. One thing I hate about carrying my laptop around is also having to lug around my (way too over-stuffed) purse along with me. So, I made a wristlet purse that matched the bag. Because I made it rather last minute, I didn’t get any pictures taken yet, but hopefully, my sister will model it for me soon and I’ll include that too. 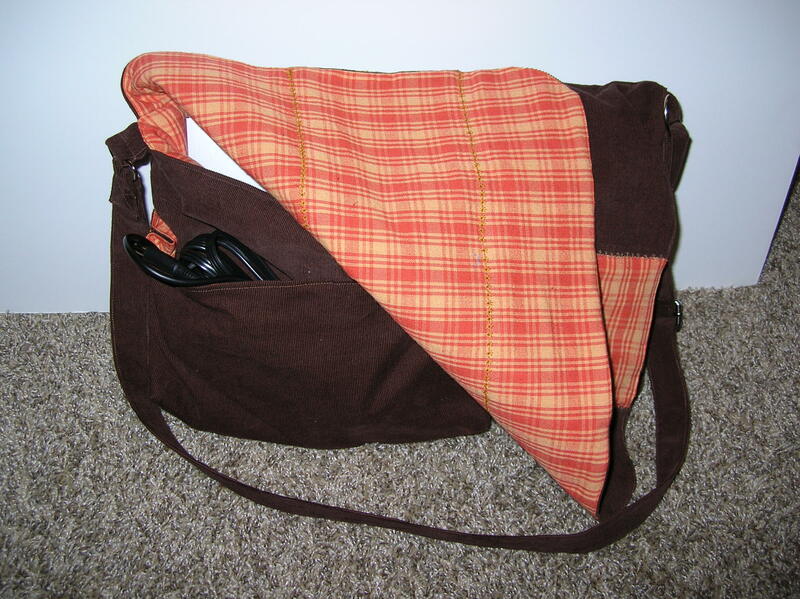 I mentioned getting the tutorial for the pockets done, but I’m also dreaming about getting both the messenger bag and the wristlet into a pattern. 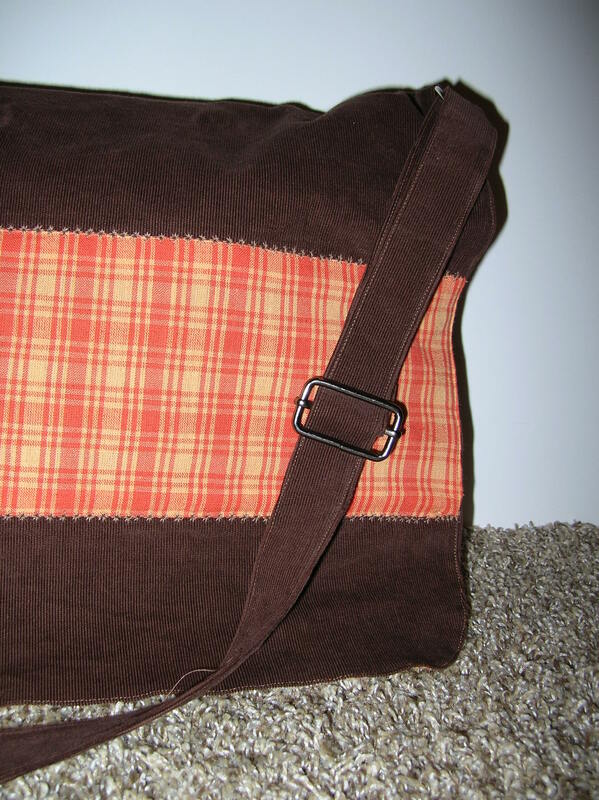 When I was searching for a good laptop bag pattern, nothing fit the bill to me like this design. Anybody interested in seeing a pattern for this?